What constitutes a memorable ski excursion is in the eye of the beholder. Everyone remembers that incredible visit to a high-profile mountain in the midst of a major storm cycle or the fantastic day of spring skiing where the snow had corned up just perfectly. Personally, as I get older and my list of “ski areas visited” grows larger, I find that it’s not necessarily the biggest, deepest, and steepest that count the most for me. 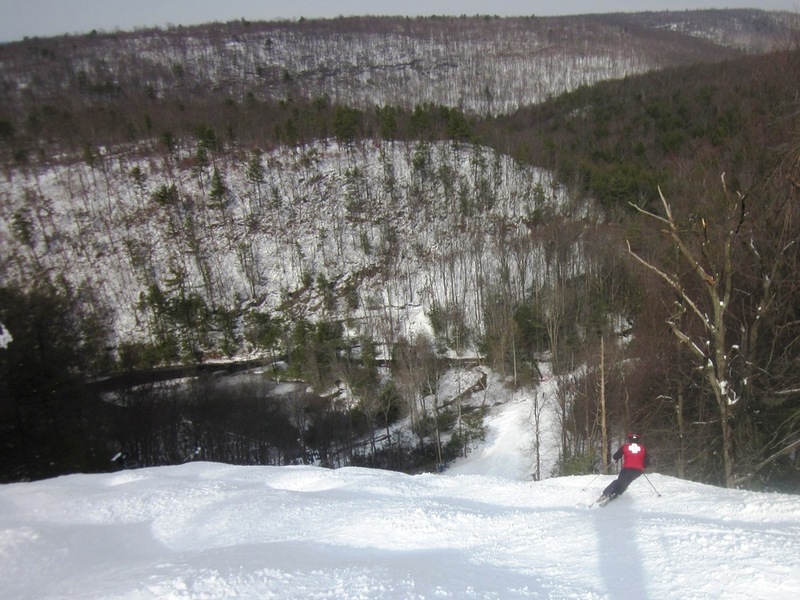 Sometimes, it’s going to what for most people would be an unintuitive location for skiing. Other times, it’s the non-skiing activities – like getting a tour of a dairy farm in France, swimming in a salt water pool inside a recreated rain forest in a hotel in Taos, a guided midnight stroll through a cute village in western Austria, or strolling through the atmospheric old town in Quebec City – that stick in my mind months or years later. Over the hundred or so times I’d driven on I-81 through Scranton, Pennsylvania during winter (the halfway point on the drive to visit family in my native Central New York), it never occurred to me to stop for a few hours of turns at Montage Mountain even though it’s about as geographically convenient as can be. That said; as a lifelong train freak, I *had* thought about visiting Steamtown, the national historic site/museum in Scranton dedicated to the golden age of steam-powered railroads. Between the two family-friendly attractions, it felt like an interesting idea to kill two birds with one stone, so last February my wife, son, and I packed the car, headed west through the Delaware Water Gap, north through the Poconos, and 95 minutes later arrived in the “Electric City,” so named because it reportedly operated the first streetcar powered by electricity in the country in 1886. In addition to being the hometown hill for Scranton, Montage’s handy location at the convergence of four major interstates (81, 84, 80, and 380) puts it within 2.5 hours of the Syracuse, New York City, and Philadelphia metropolitan regions. 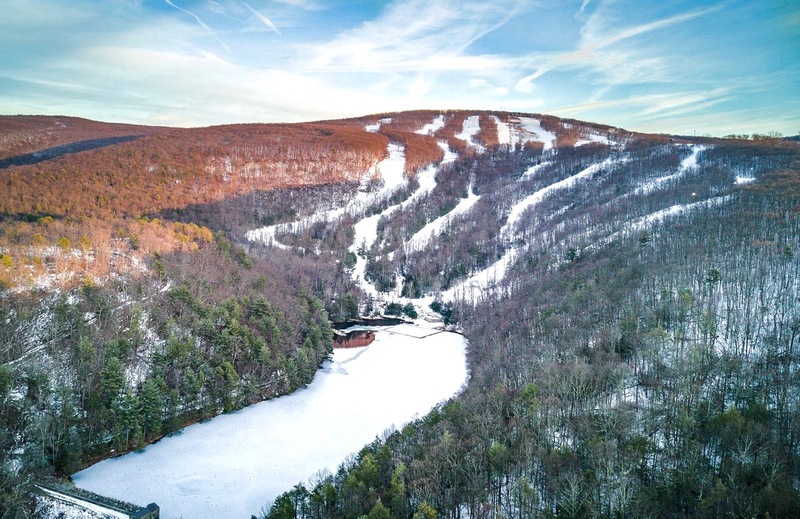 Montage’s 140 acres of trails with 100% snowmaking and lighting draw an average of 107,000 ski days per season. There are a number of large hotels a couple minutes away and they’re breaking ground on a slopeside hotel in 2018. Given its location north of the Poconos, you can’t go to Montage expecting a significant natural base, hence the 100% snowmaking capabilities; however, we managed to time things nicely following a nine-inch storm two days earlier. 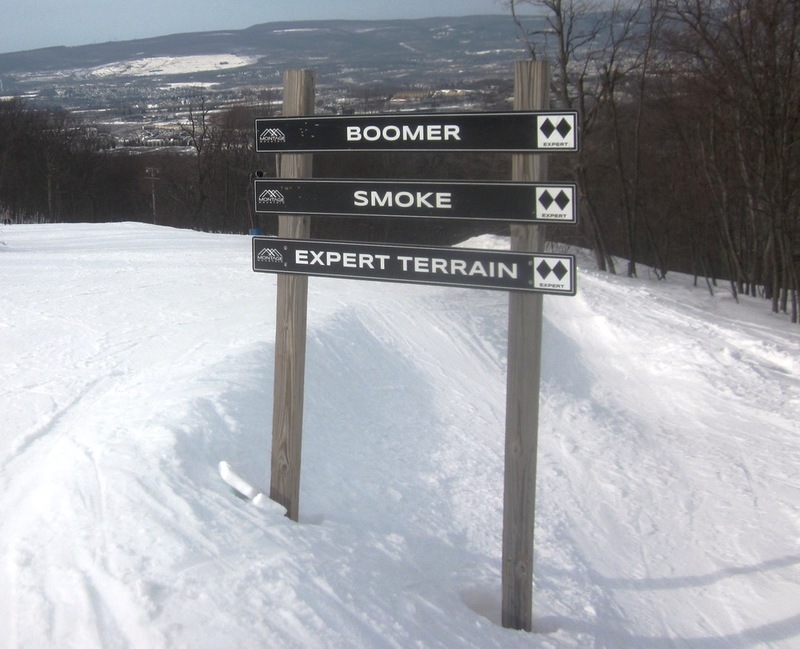 The 1,000 vertical feet of north-facing terrain overlooking the Scranton/Wilkes Barre valley has a nice assortment of terrain for families, including gently-pitched beginner trails on the upper mountain, some intermediate trails on the far looker’s left, and an assortment of short, but surprisingly well-pitched black trails on the lower mountain, including what’s billed as the second steepest trail in the mid-Atlantic region. The terrain breakdown worked perfectly for us as my wife and son worked on his technique on the green trails while I did laps on black runs like Boomer and Smoke. I kept expecting to punch through to ice or snowmaking boilerplate on the steeper sections, but I never hit anything other than soft natural snow, so props to the grooming team. At the mid-mountain base area, there was also a hopping party going on that included tents with live rock bands, a well-stocked ice bar, a snowboard manufacturer, and all sorts of giveaways. As my wife and I downed craft beers, ate burgers hot off the grill, and nibbled on free Clif bars, this “urban skiing” experience felt pretty ideal as a family getaway. As the sun set behind the hills, we repaired to the pleasant Hilton hotel downtown, had a great dinner in the ground-floor restaurant, after which my son and wife took advantage of the indoor pool and hot tub before turning in for the night. 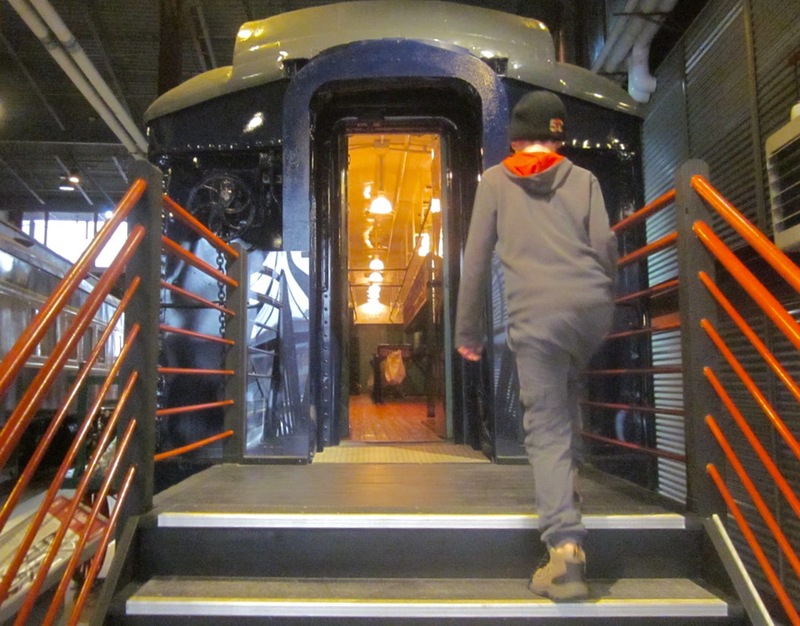 We planned on skiing Sunday morning at Montage; however, rain had moved into the entire northeast overnight so the three of us took our time at the breakfast buffet the next morning and headed over to our big event for the day: Steamtown National Historic Site. It’s an interactive museum built in the shape of a huge roundhouse on the former Scranton railyard of the Delaware, Lackawanna and Western railroad, which has been in continuous commercial operation since 1851. In the middle of the roundhouse is a turntable that’s used to spin the collection of operating locomotives. The museum is designed to provide an extensive overview of railroad history specifically in the northeastern Pennsylvania and New Jersey region, the role of anthracite coal during the decades-long supremacy of steam-powered railroads, the ascendance of diesel trains (which quickly ended the era of steam trains), followed by the death of passenger railroading, particularly in the Scranton area. 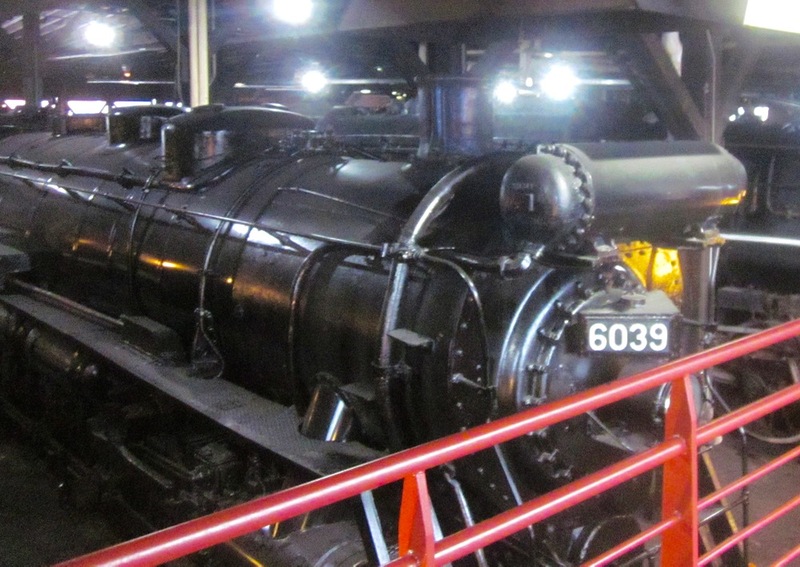 The market differentiator for this museum is that you can walk through a wide variety of vintage rolling stock, including cabooses, mail cars, boxcars, passenger cars, dining cars, and a private sleeper, and climb up next to the retired and still in-service locomotives in the roundhouse. It’s humbling to stand next to one of these massive steel monsters and think about how much work went into designing, building, operating, and maintaining them. As a railroad freak, I was fascinated by all of it, as were my wife and son, and could’ve easily spent a couple more hours there. The only downside to going to Steamtown during ski season is that they don’t offer train excursions in the winter. That’s fine as we plan to go back during the summer months. In short, we had a great family weekend in Scranton – a city that doesn’t immediately register to many as a quasi tourist destination: who knew? When we go back to ski Montage next winter, in addition to a return visit to Steamtown, we’re also planning to check out the Houdini museum! James nice article. I’ve had some pretty fun ski days and nights at Montage. Next time in town if you have not take the coal mining tour. You will not be disappointed. Thanks, Gunny. Yeah, I knew that Montage was there but never made the effort to check it out. A good family ski area and as mentioned, the black-diamonds at the bottom were short but fun and in beautiful condition the day I was there. I’ll definitely check out the coal mining tour! Hey James this is only a little over a year old so why not comment. Sno mtn Montage never drew me from NJ when I lived in Sussex cty. Between VVGG and Camelback or north never considered WBarre. Kinda a steam train buff myself, Del-Lackawanna went right thru Sussex/Warren through the gap and there was talk of reopening it but I don’t see it happening. Keep working w Claude on skiing you never know how his love for it may blossom like his dads!